Ah the driving genre. The wind in your hair, the skid marks in the rear mirror and the occasional pesky blue shell up your bum. It’s not difficult to see why these games are popular, but, especially in this latest generation of consoles, the driving genre has seemingly stalled. A good example is Mario Kart 8. Yes the Switch version is heaps of fun, but the game is essentially three years old as it was first released on the Wii U in 2014. And then there’s the Dirt series. First appearing on the gaming horizon in 1998 - with Colin McRae Rally - it’s long been considered the go to rally sim. To be fair, that’s not a huge compliment considering the lack of rally competitors, but still. It's a long and winding road. Sigh. Dirt 3 had us tearing our hair out at the wheel, thanks to its skating on ice physics. Thankfully Dirt 4 has taken its skates off thank goodness, but has sadly failed its MOT in other areas. Not long after booting this driving bad boy up, on only the second race, a fog like no other descended upon us. It was realistic for sure, as visibility was down to zero. However, driving in first gear with no idea where the road is about as much fun as wiping doggy doo off of your shoe. The weather wasn’t our only issue however. Supposedly being a realistic portrayal of the world of rally, we were surprised to see how often our vehicle flew into the air, doing multiple rolls, before landing on all four wheels and going on its way like nothing had happened. If this was a regular occurrence in real life rally, we would expect it to be a bigger spectator sport than it currently is. And in the lead is...hell, I don't know, they all look the same to me. While driving in the rallies, there is very little room for manoeuvre. The vistas are adequately pretty, but the road ahead always feels uncomfortably narrow. It reminded us of those driving games of old that essentially had you driving in a straight line, with the occasional left or right movement. 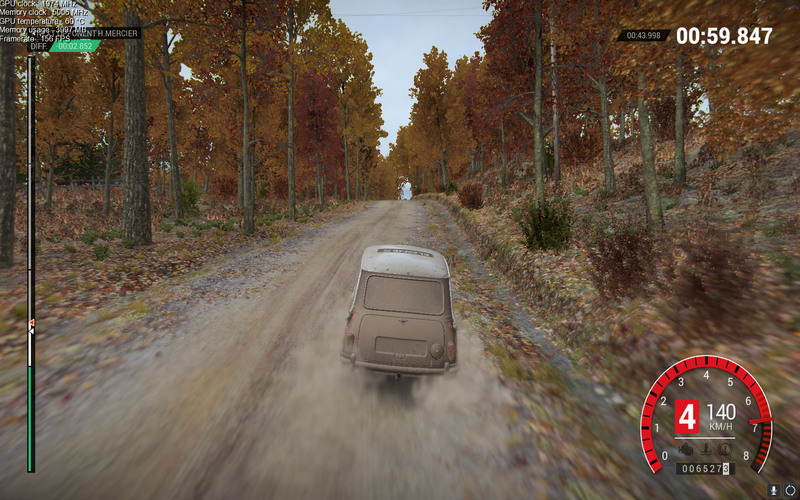 That’s Dirt 4 that is. A little wiggle room would be nice, for sure. Thankfully there are other driving modes which include actual racing with other vehicles at the same time on the same track, but even these don’t feel terribly rewarding. Overall, the series just doesn’t appear to be moving forward with any sense of exciting momentum. It’s not Codemasters’ fault; it’s a driving rally game and there’s not a whole lot you can do with it, in the same way you can’t with football sims like FIFA. If you are a huge rally fan, then what Dirt 4 offers may well be enough to satisfy your driving needs, but if you’re a casual racer, this particular vehicle will be further back on the grid and feels like the franchise may well be stuck in reverse.